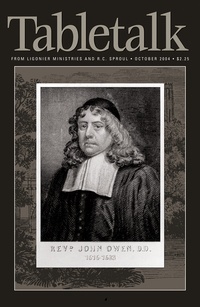 The October 2004 issue of Tabletalk looks at the life and thought of John Owen. Contributors include R.C. Sproul along with Alistair Begg, Sinclair Ferguson, George Grant, Robert Oliver, R.C. Sproul Jr., and Carl Trueman. Tabletalk features articles about topics central to the Christian faith and daily, in-depth Bible studies.